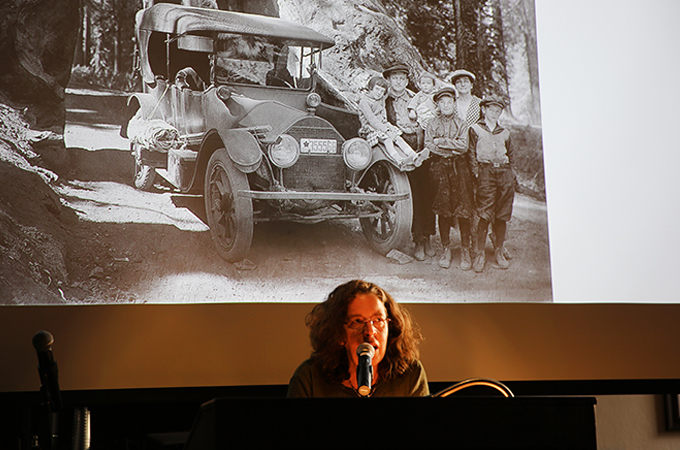 Members of the University community gathered November 1 to hear award-winning journalist, author, and independent historian Miriam Pawel read from her most recent book, The Browns of California: The Family Dynasty that Transformed a State and Shaped a Nation (Bloomsbury Publishing, 2018). The event was the second installment of the Creative Writing Reading Series and was cosponsored by the History and Political Science Departments and the Hall Network for Innovation in Public Policy. In addition to reading from her book, Pawel presented in-depth background information on the Brown family, whose members became political forces in California. Beginning with the family’s settling in Colusa, California, Pawel discussed Pat Brown’s childhood, adolescence, marriage and family life, and political career, including his successful campaign for governor in 1959. In researching the book, Pawel met with Pat’s son, Jerry Brown—the governor of California from 1975 to 1983 and again from 2011 to the present term, which ends in January 2019—to discuss his family’s history. In addition to these meetings, she spent hours researching the Browns in the library at the University of California (UC), Berkeley, where both Jerry and his mother went to college. Certain people and locations stood out to Pawel in her research, including the accomplished and self-educated women in the Brown family. Pat’s mother, Ida Schuckman Brown, visited San Francisco when she was 18 and stayed. Her time in San Francisco included attending lectures and going to libraries—something that was unusual for women her age. Nearly 30 years later, Pat would marry Bernice Layne, a woman he began courting when she was a 14-year-old prodigy at UC Berkeley. After discussing Pat Brown’s life, Pawel moved on to the life and career of Jerry Brown, including his journey through Jesuit seminary to becoming the youngest elected governor of California. She explained how the younger Brown’s career was defined early on by challenging the status quo, which led to unpopularity with his constituents, only to be resolved in a story of resurrection when he was elected as governor for the second time in 2011. Pawel noted that one of the challenges of writing a book that spans decades and generations is connecting the dots between the people and places that exist today and those that only exist in pictures. In addition to interviewing the Brown grandchildren, she said she needed to gain a sense of place to understand the family. Next up in the Creative Writing Reading Series is author and U of R Visiting Professor Francesca Block, who will be reading excerpts from her novels on November 29 in Hall of Letters 100. Learn more about the Creative Writing Department.